Home » Article » Meeting Planners Resolution for 2013…Tips to a Successful Year! Here we are sitting at our desks with all these New Year’s resolutions floating around… all best intentions ready to take on the new year. 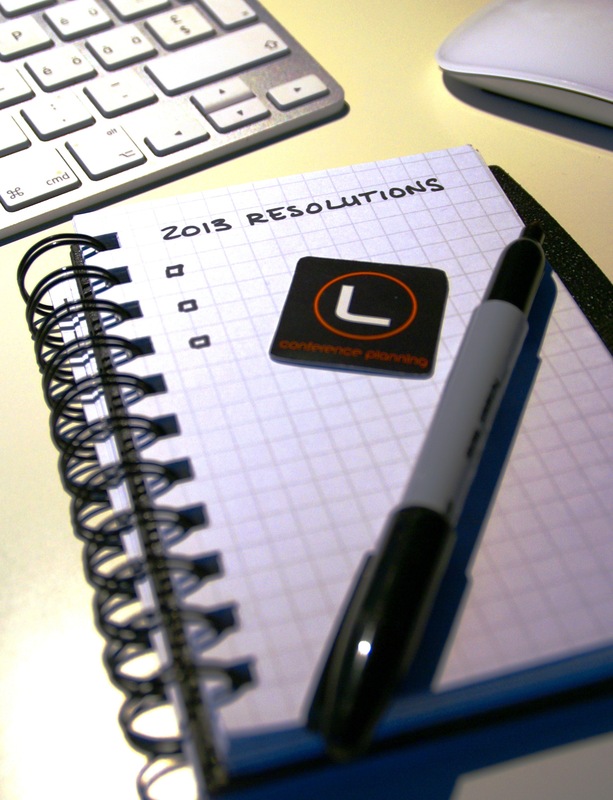 But maybe we believe that we are so organized that we don’t need to add new resolutions to our list for the office…? Both professional and personal resolutions are an important element and the successful well rounded professional that we are, are no exception to the rule… so let’s start there: let’s choose our top 3 for each! 1. Balance your life – You need to “schedule” time for yourself, take a walk for 30 minutes, find an exercise program you can do and add healthy food choices to your daily meals. It adds the fuel you need to maximize your critical thinking, remember those finer details and keep your sanity when those tight deadlines are looming. Let’s start with doing this 3 days a week for the next 2 months… you can do it! 2. Disconnect from those electronics – Smartphone, tablet, computer whatever electronic device keeps you handcuffed to the global world…its time to turn them off. Uninterrupted quality time with your family and friends is important. Kids grow up too fast, the world is moving too quickly and you don’t want to lose those valuable moments with your loved ones. That goes for everyone…not just you! Let’s start with 1 or 2 days per week for the next month…see how it goes. You won’t believe how much more efficient you become and how expectations of others are modified. Let’s face it…less stress too…try it! 3. Pay it forward! Do something special for others. It’s good for your karma. During the Xmas season we see the generosity of others in many ways, through contributions to charities, complete strangers offering to pay for the next cars order in the drive thru or to volunteering at a shelter, gift exchange program or helping a neighbor. Do this year round, every month… why do we have to wait and do it only during the Holiday season. It’s the right thing to do and puts a smile on someone’s face and yours too! 1. De-clutter that desktop screen on your computer. Let’s face it, we use that “folder” much too often and leave final and valuable documents there. Then when its time to locate it, we don’t think to look there. Which brings us to Part B of this resolution; take this time to set up your folders under Documents for the new year. This allows you the time to organize yourself. New projects, this should be the first task you do to ensure an organized folder system. Get ready, it saves you a tremendous amount of time searching for that document when you hit save and don’t know where it went. A messy desktop will be a thing of the past! 2. Back up – Back up – Back up. Recently a partner had her computer stolen onsite at an event… her 3-day old back-up saved her from an unthinkable situation, after all, the only harm was a missing piece of electronics… but you can’t afford to lose months of work in a snap (Ignore the pun!). By now you should know that Murphy’s Law’s your first attendee to any event/conference you plan.. so give him your best seat! 3. Invest on your internal organization. Create template documents and folder. Are you always more or less using the same folder filing system? Why not create a blank one you can copy paste and use at will? This way you’ll find documents faster, you know exactly where to look for you’ve had been using the same location in past project. You don’t want to waste your precious time by doing things you’ve done a thousand times before. Your staff can benefit from this too, create master documents where format is already defined and designed, this way no one loses time on details already taken care of. Ok…Top 4 … its important! 4. Network! You wouldn’t put all of your trust in a complete stranger, would you? By now you should know that 99.9% of business comes mostly from connections and “I’ve heard they did a great job”… so go out there and connect! We live in a world where nothing falls from the sky … so get out there, set the example, take time to train and share, be generous… ROI (Return on Investment) the awards will be plentiful. Many want to set goals to be met by the end of the year with the best intentions … but often we find we are too hard on ourselves and those goals are way too ambitious… the key here is to start with baby steps instead. Sometimes its easier to meet objectives when you start with some “easy” ones that you can accomplish in 1 to 2 months…is it sounding like a critical path/action plan to you yet? So let’s put down some goals that are attainable for the next few months…we can always add more later…haven’t we done that before! Please share your top 3 with us…no idea is a bad one! By legend2013 in Article on January 16, 2013 .